Look out for a new feature on NFL jerseys. Players who have received the Walter Payton NFL Man of the Year award will sport a special patch on their uniforms. Drew Brees, who won the award in 2006, will become the first player to sport the patch when the New Orleans Saints play the Atlanta Falcons on Thursday night. 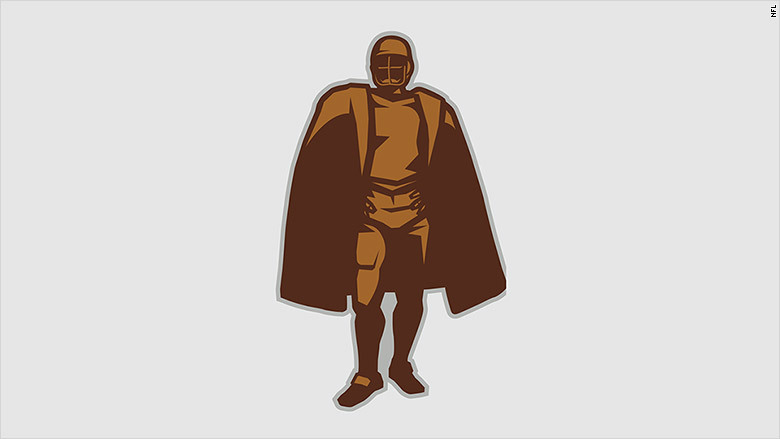 It's a silhouette of a football player wearing a sideline coat, meant to look like a cape. The patch was modeled after the trophy for the award. Man of the Year is given to players who demonstrate a dedication to their communities off the field while excelling in the sport. "It's just like a captain's patch," Brees told CNNMoney. "Guys who have a captain's patch wear that with pride, and I think they will wear the Walter Payton Man of the Year patch with pride as well." Brees won the award for his work with his foundation, which raises money to help find a cure for cancer and help cancer patients. Winners of the NFL's Walter Payton Man of the Year Award will wear a special uniform patch. The award is typically given to one player a year, nominated by his teammates. Each of the 32 teams picks a player, and three finalists are selected in January. The winner is announced the night before the Super Bowl. Last year, Arizona Cardinals wide receiver Larry Fitzgerald and New York Giants quarterback Eli Manning both won the honor. Fitzgerald credited his mother with encouraging him to be active in his community and give back. He told CNNMoney that he's honored by the award and that his mother, who passed away in 2003, would be proud of him. While he's a "bit shy" about wearing a patch to commemorate his volunteer work, he said the winners discussed it closely with the NFL. The league wanted to be sure players were comfortable displaying their award on their jerseys. "The consensus was that the guys were OK with it," he said. "It's about trying to get guys on the same page to continue to inspire and motivate others to get active and have a presence in their communities." He wouldn't say who he thought deserved to be this year's winner, but he complimented Houston Texans defensive end JJ Watt for the work he did to raise more than $37 million for victims of Hurricane Harvey. Past winners who are still playing will wear the patch on their jerseys. Other winners who are still active include Carolina Panthers linebacker Thomas Davis and Dallas Cowboys tight end Jason Witten. All winners will get to wear the uniform patch for the rest of their careers. This season's nominees will be announced Thursday. They will get to wear a Man of the Year decal on their helmets for the rest of the season. The award has been around since 1970 but was renamed for Hall of Famer Walter Payton in 1999 after his death. Payton was known for his amazing skill as a player and his humanitarian work with at-risk youth.